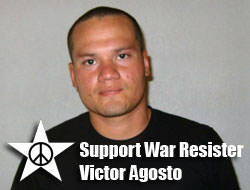 Support Afghan War resister Victor Agosto! Sign the petition to drop court martial charges against Fort Hood soldier Victor Agosto. Please donate to him legal defense fund. Kimberly Rivera, mother of three, wife, and soldier of conscience is now living in Canada, but that could all change on July 8th. If you can't join us, sign the "Dear Canada" letter and we'll deliver it on your behalf. Questioning the war? You are not alone. Fort Hood, Texas - SPC Agosto, assigned to C Company, 57th ESB, at Fort Hood, Texas, is now facing court-martial for standing up for his beliefs. On April 30, he informed his company commander that he would not deploy to Afghanistan. Since May 11, he has refused all orders directly supporting his unit’s deployment. Demand that the commanding general of Fort Hood, TX, and the convening authority for his court-martial drop all charges against SPC Victor Agosto! "I support Army Specialist Victor Agosto's principled stance against the unjust war against the citizens of Afghanistan." Add you name to the online petition and send Victor a message! Join Courage to Resist at a rally outside of the Canadian Consulate in San Francisco. Kimberly Rivera, mother of three, wife, and soldier of conscience is now living in Canada, but that could all change on July 8th. We will bring signed petitions to the Consulate General, urging the Canadian politicians to respect the will of the Canadian people, the Canadian parliament--whom have twice voted recommendations to allow war resisters to stay--and the basic moral imperative that does not separate children from their loving mother. Kimberly Rivera is the first outspoken female Iraq War resister to publically and legally seek refuge in Canada. Kimberly, along with her partner Mario, son Christian (7 years old) and daughter Rebecca (4 years old), fled to Canada in January 2007 when Kimberly refused redeployment. In late November 2008 Kimberly gave birth to her Canadian daughter Katie (8 months old). 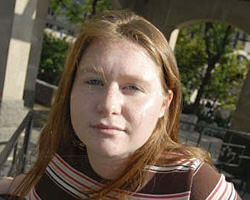 She served in Iraq in 2006 and experienced, firsthand, the reality of this ongoing illegal war and occupation. On July 8th, Kimberly is going to Canadian federal court, to appeal the decision in her Pre-Removal Risk Assessment. If her appeal fails, she will be asked to leave Canada, or forcibly removed – and delivered into the custody and jurisdiction of the United States Army where Kimberly will face charges that will carry, at the very least, a 4 year sentence in a military stockade. "GI resistance against war is anything that gives service members and veterans a voice and makes it harder for the military to function like a well-oiled machine. It ranges from reading anti-war literature to refusing an order to refusing deployment to a war zone. GI resistance is not dishonorable, and it will not put the lives of your buddies in jeopardy. Rather, it is a concrete way to end war and bring the troops home. GI resistance played a central role in ending the war in Vietnam. 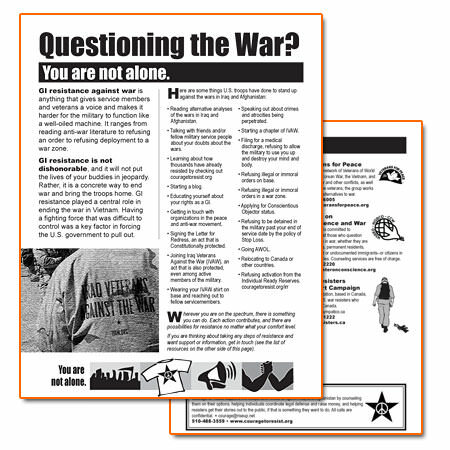 Having a fighting force that was difficult to control was a key factor in forcing the U.S. government to pull out..."
The back side of leaflet lists contact information for various organizations that support GI resistance. View, print, and distribute the PDF GI outreach leaflet!